Meet one of UCCA’s newest community contributors! 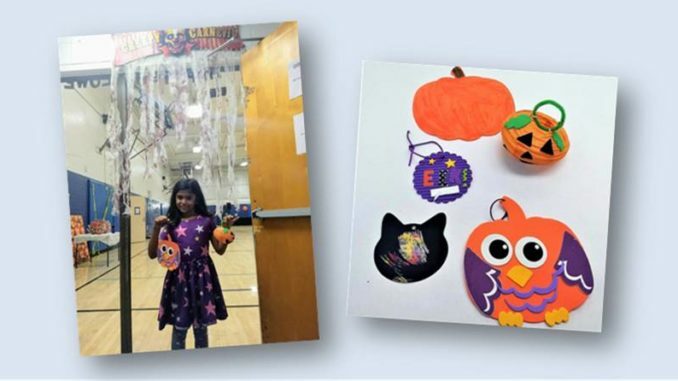 This report was submitted by one of our youngest volunteer reporters ever – eight year old Nethra Venkat (pictured). We thank her for her timely article. Those who missed this year’s Standley Halloween Carnival will have to wait until next year to get in on the fun. A Halloween carnival was organized by Standley Recreation Center on October 26, Friday from 5-7pm. There were several activities for everyone to participate in and enjoy. In the gym, there were several games. There was ‘guessing the candy in the jar’ and ‘the spiders on the web’ – people had to guess how many there were and the person with the right answer won a prize. Another game was ‘knock them down’ where participants had to knock down foam cans with bean bags. For bean bag toss, you tossed beanbags into little holes that had numbers for how many points you received. In ‘tic tac toe’, you stood behind a blue line and tried to get a bean bag into the tick, tack and toe squares to complete. In ‘ghostly flush’, you had to get toilet paper into a fake, decorated toilet. ‘Howling for golf’ was where you had to get golf balls into a hole. In ‘booling’, you had the option to knock down candy corns or bowling pins. In the ‘pumpkin lollipop’ game, there were 2 pumpkins with several lollipops. If you picked a lollipop with red on the stick, you got to keep it. Winners were given a piece of candy. There was a bounce house with a slide and ladder which was popular! There were crafts in another room where people could decorate a foam pumpkin, scratch a cat face, make jack-o-lanterns, create monsters and owls which was fun. Thank you to all volunteers who made this event happen.